A recent study found that a third of the issued patents from the USPTO required a Certificate of Correction to fix the contained mistakes. Therefore, the need for patent proofreading does not stop after the patent gets issued. In the last step, you will still need to verify that many parts of the patent are correctly assembled and published by the USPTO. Many of the above steps will require manual proofreading, but ClaimMaster could still help you with some of the operations. 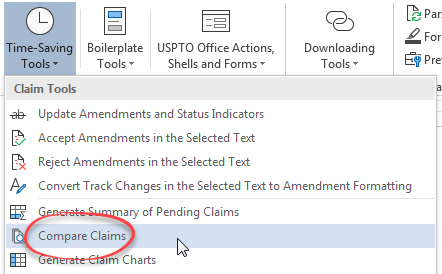 For example, you can use ClaimMaster’s Compare Claims feature to make sure that the issued claims are the same as the last claim set submitted to the USPTO, as explained below. 1. Open a Word document with the latest Office Action response or proposed amendment. Click on Compare Claims under the Time-Saving Tools in the ClaimMaster tab. 2. Once the compare dialog comes up, switch to the Compare to Patent tab and enter the newly issued patent number, as shown below. Here you can also select whether to compare all claims or just independent claims. 3. Next, click the Compare Claims button. 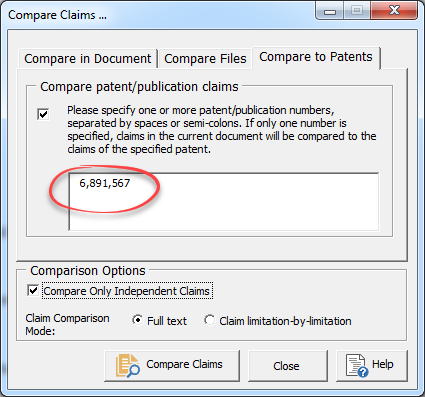 ClaimMaster will download the claims from the issued US patent and compare them to the claims in your document. Any inconsistencies (there should’t be any) will be flagged, as shown below. This little compare trick could save you from significant problems, as even small mistakes or changes in the issued claims that go unnoticed could spell trouble during patent enforcement many years later. We plan to add other tools to help with post-issuance patent proofreading. In the meanwhile, if you’d like to try out ClaimMaster on your patent documents, download the free 30-day trial from here.